Free admission for card holder into the park for 1 or 2 years depending on the membership purchased. 10% off of all in-store Civil War Store purchases. Subscription to the quarterly newsletter and notifications for upcoming park events. Discount admission to special events and like our Teas and Halloween program. Invitation to our exclusive annual Member’s Party. Choice of 1 gift item from the Admissions Desk. Free admission for cardholder and one additional park visitor for 1 or 2 years depending on the membership purchased. Discount admission to special events such as our Tea and Halloween programs. Free admission for cardholder and five additional park visitors for 1 or 2 years depending on the membership purchased. Choice of 2 gift items from the Admissions Desk . Choice of 2 gift items from the Admissions Desk and a complimentary copy of Prelude to Surrender by Dr. Robert Pamplin Jr. Choice of 3 gift items from the Admissions Desk and a complimentary copy of Prelude to Surrender by Dr. Robert Pamplin Jr.
A Behind-the-Scenes tour of the museum with a staff guide. Choice of 4 gift items from the Admissions Desk and a complimentary copy of Prelude to Surrender by Dr. Robert Pamplin Jr.
A Behind-the-Scenes tour of the museum and the park collection with a staff guide. 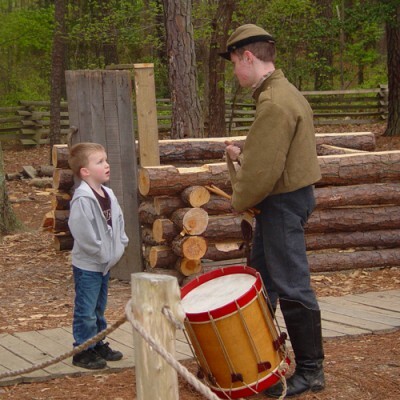 25% off annual Symposium admission and Civil War Adventure Camp tickets. 20% off of all in-store Civil War Store purchases. Choice of 5 gift items from the Admissions Desk and a complimentary copy of Prelude to Surrender by Dr. Robert Pamplin Jr.
Free registration to the annual Symposium. 2 complimentary Individual gift memberships. 5 complimentary Individual gift memberships. All membership levels are available as gifts! Gift memberships may be sent directly to recipients or we can provide a certificate for your use. Gift memberships come with a small bonus gift from our Civil War Store. Please call or email for more details. Membership is good for one or two year(s) from date of purchase. AAA discount does not apply to membership program. Admission and Membership prices subject to change. Please Click Here to purchase a membership online. Please Click Here to download a PDF of our membership application. For assistance with your membership registration or for more information on our Member Program, please call (804) 861-2408, or email Member Services.